Earlier this week, we cut up all of new Philadelphia Eagles wide receiver Mike Wallace's targets on the 2017 season, and published that video, with analysis. 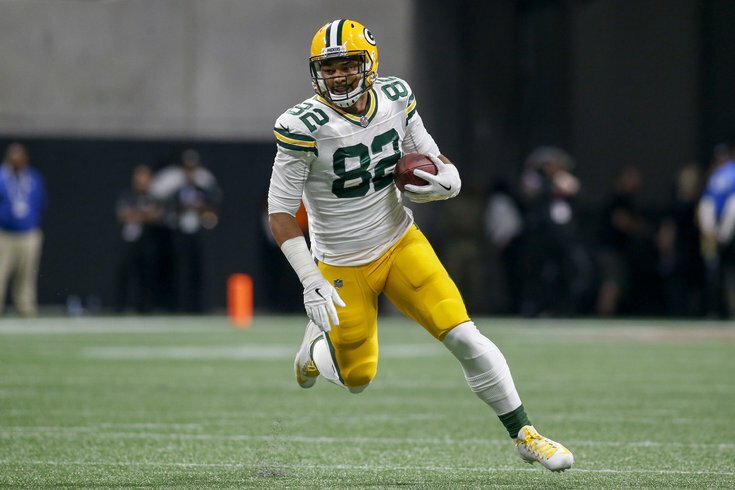 With the Eagles' signing of former Packers tight end Richard Rodgers, I figured we may as well do the same thing. In Rodgers' case, however, I opted to look at 2016 instead of 2017, for two reasons. First, Rodgers only had 19 targets on the season in 2017, so that would be a pretty short video, and more importantly, the Packers' offense went in the toilet after Aaron Rodgers went down with a shoulder injury, so I didn't think that looking at 2017 would provide a good look at Richard Rodgers. • The most glaring takeaway that I had of Rodgers during this exercise is his inability to create separation. More often than not, safeties and linebackers are draped all over him, and you see an abnormal number of pass breakups relative to his number of targets. That lack of speed shows up on game day. In Green Bay, many of Rodgers' receptions came as a result of an elite quarterback willing to attempt tight window throws, whereas he might otherwise be a complete non-factor with, say, a timid quarterback like Sam Bradford. In Philadelphia, Rodgers will again play with a strong-armed quarterback in Carson Wentz who is more than willing to make throws into tight windows. • Rodgers isn't much of a playmaker once he has the ball in his hands. I counted just two missed tackles on him, and certainly, the aforementioned lack of speed does not help him gain yards after the catch. • Rodgers has a reputation for having good hands. I didn't see that, at least in watching his games in 2016. Perhaps in other years he was better, but he left several plays on the field with drops in the video above. • Not shown were a few heady special teams plays that I noticed while watching Rodgers. On a very windy day against the Redskins for example, the Packers' kick returner misjudged a kickoff, and the ball was bouncing around at about the two yard line, completely up for grabs. The Redskins' kickoff team nearly ran down and recovered the live ball, but Rodgers was able to alertly jump on it in time. I'll also note that he recovered two onsides kicks in 2016. It's perhaps noteworthy that Rodgers' father was the special teams coordinator of the Carolina Panthers from 2012 to 2014, before coaching the defensive backs. • We didn't look at Rodgers as a blocker here, obviously, but the consensus opinion on him in that regard is that he's average, at best. Rodgers signed with the Eagles in April, three weeks after the start of free agency, almost certainly on a veteran minimum deal. He is a clear downgrade from Trey Burton as a receiver, and probably also Brent Celek. He is also not as good a blocker as Celek, based on the consensus view of him in that regard. The Eagles needed to fill two holes at tight end, and this was very clearly a Band-Aid signing, though Rodgers does at least bring 63 games of regular season experience, and seven games of playoff experience. In my view, he is not guaranteed a spot on the roster in 2018, and the Eagles will likely not feel like they have definitively plugged a hole at tight end with Rodgers' arrival. I would still very much look for them to be in the tight end market in the 2018 NFL Draft, with Rodgers serving as an experienced fallback if they are unable to find better options.